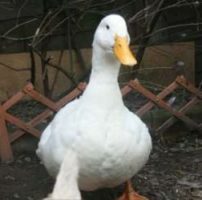 A guide to breeds of Ducks including Aylesbury, Indian Runner, Campbells & Call Ducks. Once you decide that the lovely rich duck eggs in the morning that have been freshly laid is the way forward you have to decide what breeds of ducks you are going to get balancing looks, egg production and temperament. 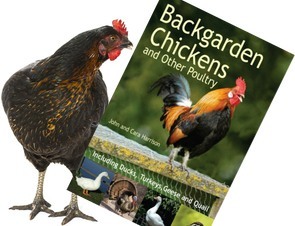 This is an overview of four of the most popular back garden ducks to help you make that important decision. 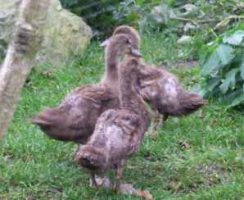 These ducks are medium to large built and have tall upright bodies with long necks and come in a variety of colours. They are good egg layers with 150-200 eggs a year over the spring, summer and early autumn months. Of all the breeds of ducks they are one of the best layers. Runners need a good sized bucket filled with water for dunking their heads in, but do not require a pond as they are very good at preening themselves due to their neck length and body shape. They are a fairly quiet breed but can be prone to nervous behaviour. This is the type of duck that is associated with Jemima Puddleduck and summer lakes in England. They are large built and a lovely white colouring. Most Aylesbury ducks as we recognise them are Utility as opposed to Exhibition birds, the difference being the exhibition birds have different colourings for their bills and slightly different posture to the common utility. You will be looking to get between 50-100 large eggs from the Aylesbury from late spring to early autumn. The Aylesbury requires large water buckets to dunk its head and a small pool of water to swim in and clean its feathers. These are slow-moving, quiet ducks who can be very good pets, especially with children. 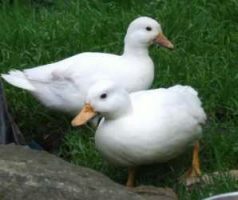 The Campbell is a hardy duck with a small to medium build and white and dark/khaki colours of plumage. If given enough space they will be able to fly so wing clipping is advisable in larger gardens to avoid escape. On average the Campbell will lay between 75-150 medium sized eggs a year, with some strong utility strains laying up to 250 a year, so ask the supplier about the strain they are selling. They require similar water features to the Aylesbury with large water buckets to dunk its head and a small pool of water to swim in and clean its feathers. The Campbell is a friendly duck that is always digging and running around the garden searching for bugs and treats. Call ducks are by far the noisiest breed of ducks that I have come across. They are beautiful, small and cute, but with the biggest voice box of them all! They come in many colours ranging in white, gray, blue, chocolate, snowy, and many variations inbetween. The Call ducks’ egg production is the lowest of the breeds discussed here, with only 25-75 small eggs layed in the summer months. They require wing clipping to prevent escape and a small pond or paddling pool to swim in. They are friendly and inquisitive ducks and good with children. Ducks and Water – Do You Need a Pond?